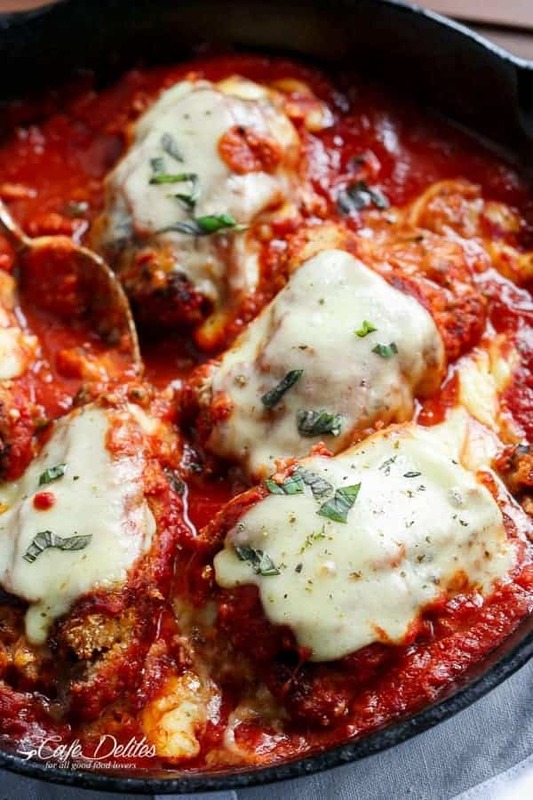 Skillet Mozzarella Stuffed Chicken Parmesan — Lightened Up! So much cheese. So much CHEESE! 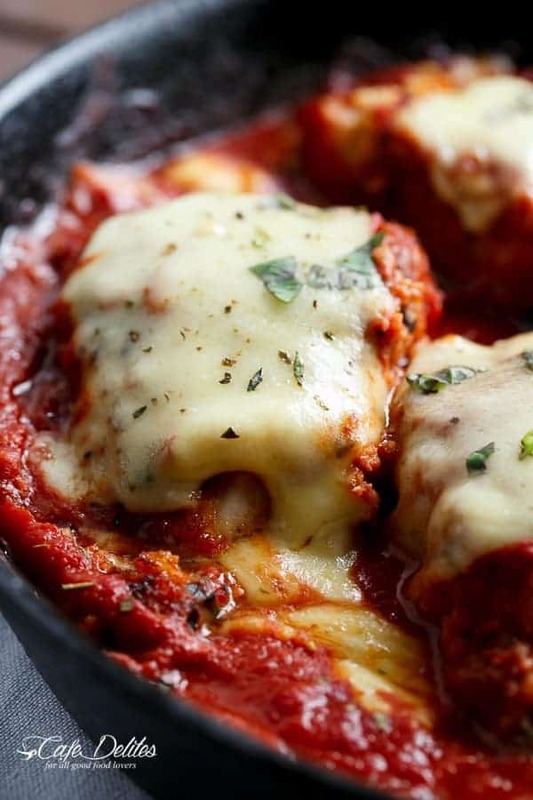 This Mozzarella Stuffed Chicken Parmesan is like a Chicken Parmigiana – inside out! 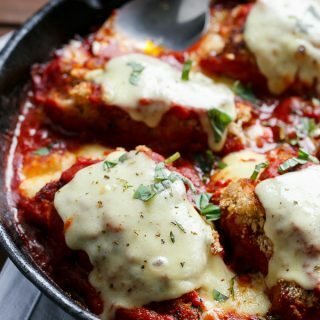 Our love for Chicken Parmigiana grows fond and deep and runs in my cheese blooded veins, but to make it in one pan…and super easy….and STUFFED with Mozzarella Cheese? Even better. Tender and juicy chicken thighs beat out breasts in this recipe, but you CAN use thin breast fillets. So easy to make all in one pan! Finish off under the broiler (or grill) to melt your cheese! Lift those chicken rolls out of the pan, cut them open to see MORE cheese ooze out of your chicken. Oh. Lord help me. Serve with mashed potatoes or pasta for the ultimate chicken dinner! Watch us make Mozzarella Stuffed Chicken Parmesan right here! 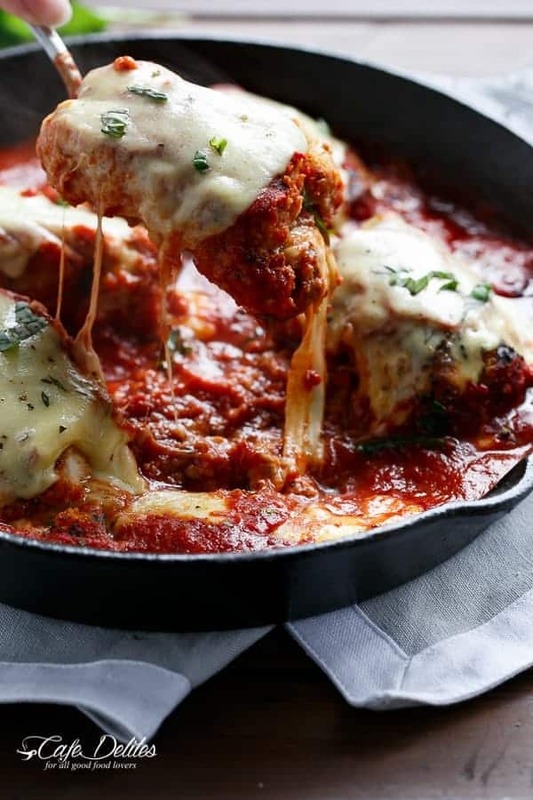 Mozzarella Stuffed Chicken Parmesan with so much cheese. 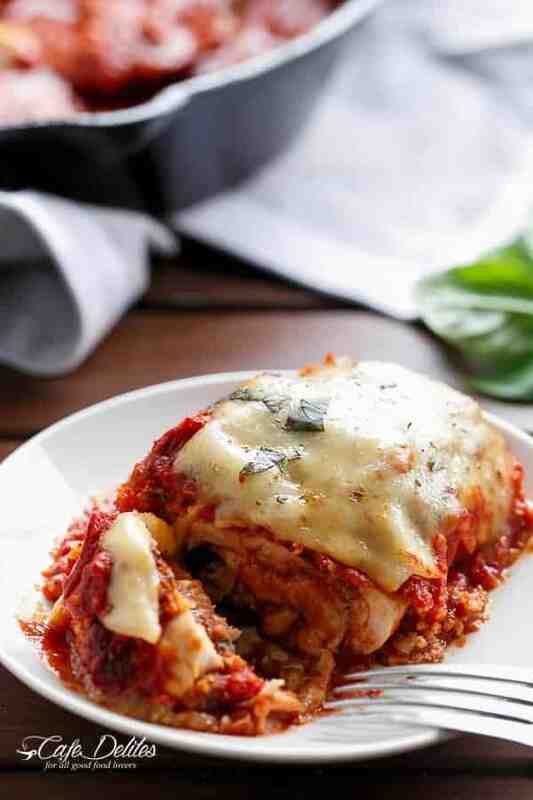 Just like a Chicken Parmigiana -- inside out! Easy to make chicken recipe! Preheat oven to 450°F (230°C). Lightly pound fillets between two pieces of plastic wrap to 1/4-inch thickness using a mallet. Pat chicken dry; season with salt. Spread 1 tablespoon tomato paste over one side of each fillet; sprinkle with parsley, garlic powder and 1/2 teaspoon of salt. Place one slice of mozzarella onto each half of a fillet and roll (starting from the cheese end) and place seam side down. (Seal with a toothpick if needed). In a shallow medium-sized bowl, whisk the the egg, garlic powder and remaining 1/2 teaspoon of salt together; set aside. In another shallow bowl, combine the breadcrumbs, panko, basil and parmesan cheese. Heat the olive oil in a 12-inch cast iron skillet (or oven-proof frying pan) over medium heat. 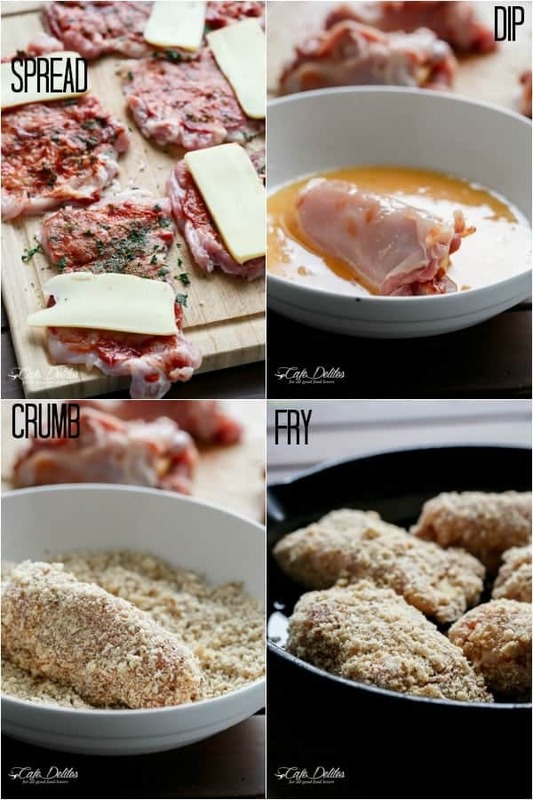 Evenly coat the rolled chicken fillets into the egg mixture, then into the breadcrumb mixture. Place the chicken (seam side down again) into the preheated skillet/pan and cook on each side for 4-5 minutes until the coating is golden brown and the cheese on the inside has melted. Reduce heat to low and pour in the pasta sauce. Move the chicken around with tongs so the sauce is evenly covered over the base of the pan; allow to simmer for 1-2 minutes until fragrant. Pour some sauce from the pan over each chicken; place skillet/pan in the oven to cook for a further 10 minutes. Remove pan from oven; top each chicken roll with remaining cheese slices; return to oven and allow to grill/broil on medium heat until cheese has melted over the top. Garnish with extra dried parsley and Italian herbs. Serve warm over pasta; mashed potatoes or with a salad. made this the other night – was delicious and a crowd pleaser! This looks awesome!I know what I’m making for Sundays dinner. Hey Stevie! That’s awesome! Please let me know how you go! It’s a BIG hit over here! So gorgeous and cheesy Karina!!! Love this!